PARTY BEN MAKES MASHUP STUPID ENOUGH TO RIVAL "WIPEOUT TAFFY"
Story of my life. I cry myself to sleep every night because mashups aren't taken seriously, and then I go and make stuff that appeals to the "fart joke" center of the brain. What is my problem? Well, whatever. As my hero Weird Al said, "Dare to be stupid." 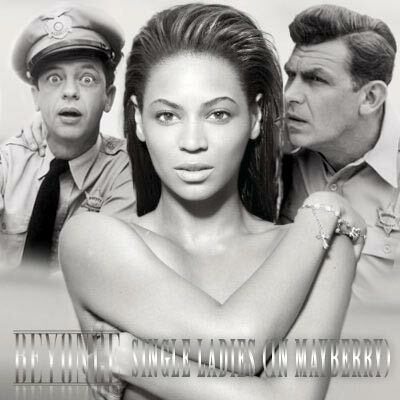 Beyonce vs. the Andy Griffith Theme - "Single Ladies (In Mayberry)"
What do I even say about this? "Forgive me"? How many "hail Mary"s do I have to do at the Church of the Freelance Hellraiser to atone for this? Is this the mashup version of a cry for help? Well, for Vidler's sake, somebody call the GYBO authorities!!! Okay, let's make a vain attempt to rehabilitate my image by pointing out something cool: awesome music blog AMFMPM featured my Kanye/Justice combo on their pages a while back, which apparently rocketed me up into the Hype Machine Top 20 for a little while, something that rarely happens because, as we've already established today, I'm not cool. So, thanks, blogosphere. Now if only this was a blog, think how popular I'd be! FUN TIMES ON THIRD THURDSAYS! 10p-2a / 21+ / FREE! It's Smash-Up Derby request night! Plus, regulars Adrian, Mysterious D, Dada and myself, plus guest sets from DJ Zax and Mad Murdock.